Digital designs for the proposed public memorial. The Arts Incubator—located across from the Garfield Green Line station and a part of the University’s Arts + Public Life initiative—is currently holding an exhibition titled Still Here: Torture, Resilience, and the Art of Memorializing. 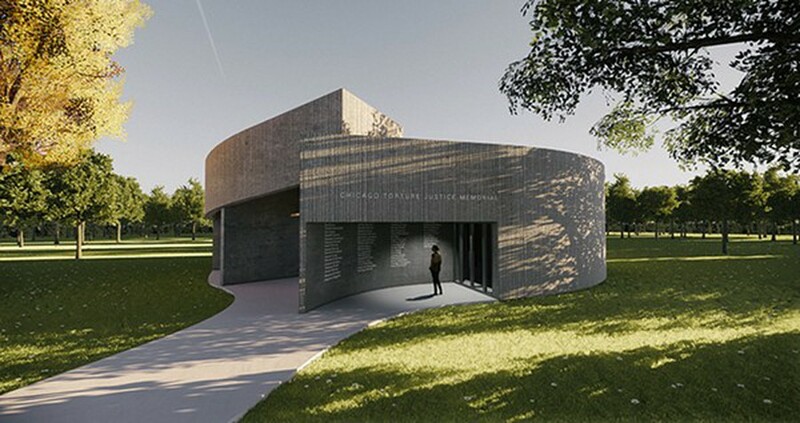 The show displays six design proposals for the Chicago Torture Justice Memorials, aiming to commemorate more than 120 African-American men and women who were unjustly tortured under the orders of former Chicago Police Commander Jon Burge from 1972 to 1991. This memorial is the final component of the Reparations Ordinance, which was passed in 2015 to make Chicago the first American city to offer reparations for racially motivated police brutality. The ordinance promises an official apology, financial reparations, the inclusion of the Burge police torture in Chicago’s public education, and more. Hannah Jasper, the curator for Still Here believes that “Chicago can lead the way in showing what reparations can be, what they should be, and how public memorials can help define our public spaces.” With the creation of the memorial, the ordinance will be entirely fulfilled. This acute concern for public art, education, and healing was a theme constantly reinterpreted throughout the six works. The commissioned artists—Monica Chadha and Nelly Agassi, Juan Chavez, Sonja Henderson, Andres Hernandez, Preston Jackson, and Patricia Nguyen and John Lee—presented wildly different pieces, envisioning mobile and static sculptures, architectural pieces, healing garden sanctuaries, and even conceptual pieces with no tangible form at all. But the artists were not the only masterminds behind the project. Anthony Holmes, one of the earliest survivors of the Burge police torture, frequented the artists’ studios to provide feedback on the designs. Jasper emphasized that the project is “not about telling the story, but providing space for those stories to be told.” The stories of the survivors and their memories were the fundamental visions for the designs. In fact, as Jasper said, “The title of the show came from Anthony, because that’s what he would tell everyone during the studio visits.” The Chicago Torture Justice Memorials Project is particularly powerful because it is not simply about commemorating a past event; it confronts a current, ongoing issue. Not only do survivors of the Burge police torture still struggle from traumatic memories, but there are also still many victims who have yet to be released. “Yeah, it’s happening right now, they’re still here! They’re still fighting!” Jasper exclaimed. The exhibition is a strong reminder of the pertinence of the fight against police brutality in Chicago.